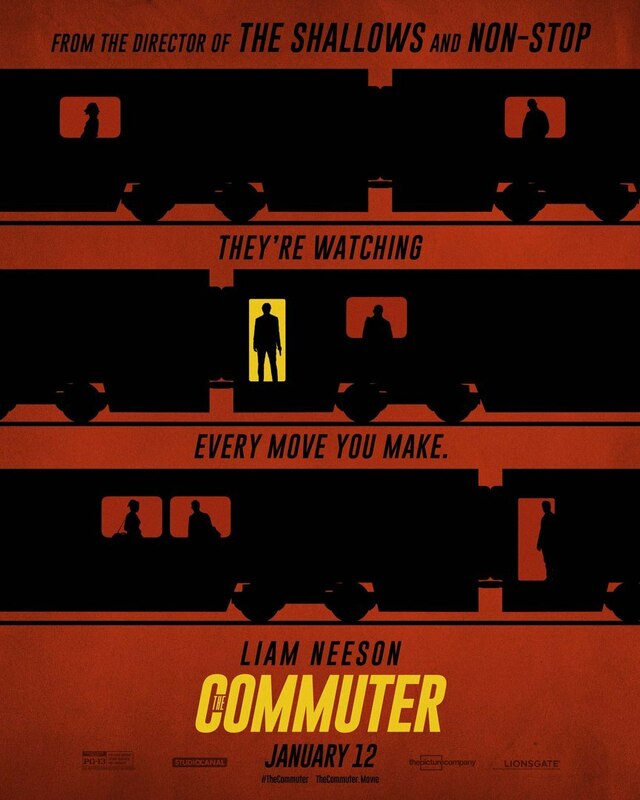 If "train movies" and not-too-scary action films are your thing, then THE COMMUTER (2018) is the movie for you. I had a very good time watching this one. Three years ago I really enjoyed Liam Neeson in the "plane movie" NON-STOP (2014). 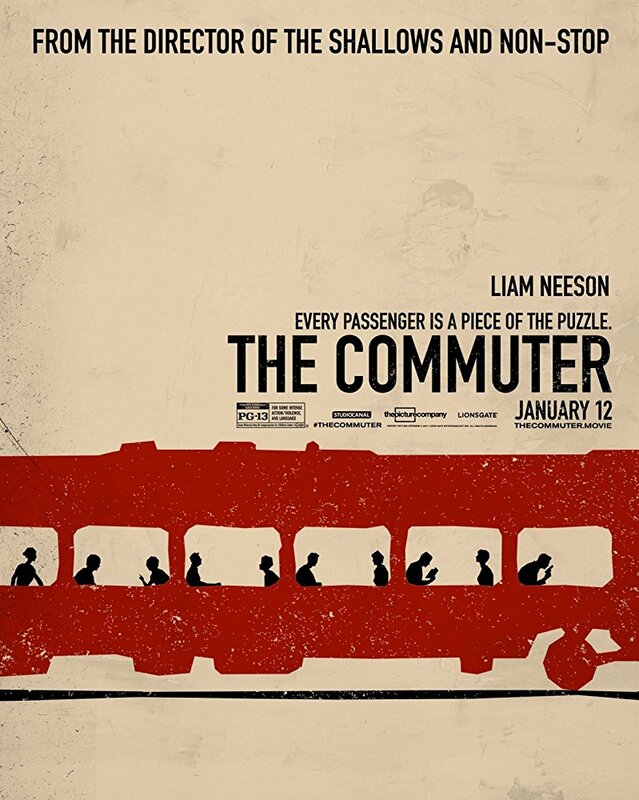 Neeson reteamed with director Jaume Collet-Serra for THE COMMUTER. 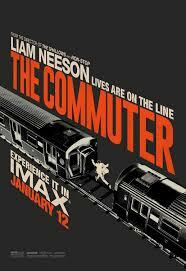 Like NON-STOP, THE COMMUTER is a good old-fashioned "popcorn flick" made to entertain, and it does so very well. The plot may be slightly confusing -- I think it will be clearer on a future viewing -- but it's executed stylishly. 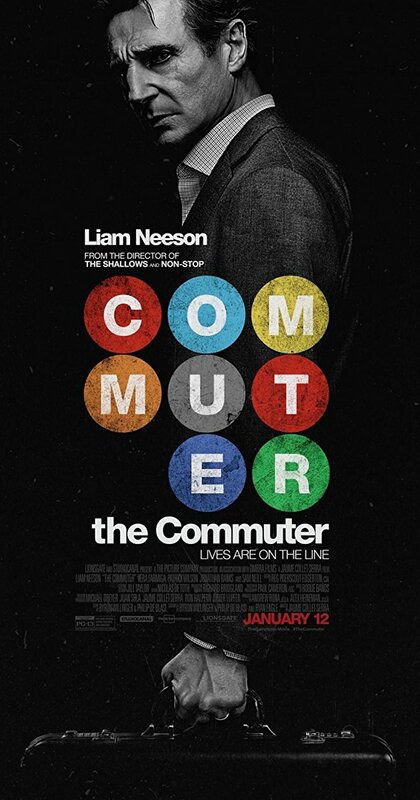 The opening sequence is particularly creative, an endless series of dissolves as we see day after day of the commuting life of Michael MacCauley (Neeson). When the camera finally lands on MacCauley's life in real time, the ex-cop turned insurance salesman is about to have a very, very bad day. He's laid off from his job, and then he finds himself in the midst of an "unusual" situation on the train home out of NYC. An odd woman (Vera Farmiga) gives the now financially desperate Michael what he thinks is a hypothetical proposition: Find $25,000 hidden in the train's bathroom, then find someone on the train who "doesn't belong." Put a tracking device on the person and receive another $75,000. That's it. Supposedly. Michael finds the cash in the bathroom and sticks it in his bag but he's not really interested in playing along. Unfortunately, it turns out the mysterious woman is somehow able to watch his every move, and the game is about to get a whole lot deadlier. Stop after stop, the cat and mouse routine continues as Michael tries to understand what the mysterious powers-that-be want; simultaneously he tries to figure out the identity of the person on board they're after, with almost nothing to go on. The film blends derivative elements -- a little MURDER ON THE ORIENT EXPRESS and UNSTOPPABLE here, a bit of THE NARROW MARGIN there, with a dash of SPARTACUS (!) on the side -- with a gritty, creative style, culminating in a truly spectacular derailment; kudos to the special effects team. Neeson's character bluntly states he's 60, five years younger than his actual age, but he's still got it as an aging action hero. His final epilogue scene left me with a big smile on my face. I'd guess Elizabeth McGovern spent two days working on the film in bookend scenes as Neeson's wife. Dean-Charles Chapman plays his son; one of the more enjoyable and unusual themes is that Neeson's character reads all his son's literature assignments in order to tutor him through high school English. The way it's tied into the rest of the plot is a fun bit. I find Farmiga an annoying actress, perhaps because I associate her with her not-so-nice role in UP IN THE AIR (2009), but I suppose in this case it made her perfect as the creepy puppet master. It's always a pleasure to see Sam Neill in a movie, here playing a police captain. I initially didn't recognize him under the gray hair, thinking "Why do I know this face?!" Patrick Wilson plays Neeson's former partner. Colin McFarlane registers well as a conductor. The movie was filmed by Paul Cameron. The running time of an hour and 44 minutes seemed just right to me. Parental Advisory: This film is rated PG-13 for some language and "intense violence." It's a fairly mild PG-13 in my eyes. Neeson does flip someone off, and there's a creepy sequence involving a corpse. On the plus side, we've got Neeson ultimately determined to protect everyone who needs it, and a community of strangers coming together to help. A trailer may be seen on YouTube. 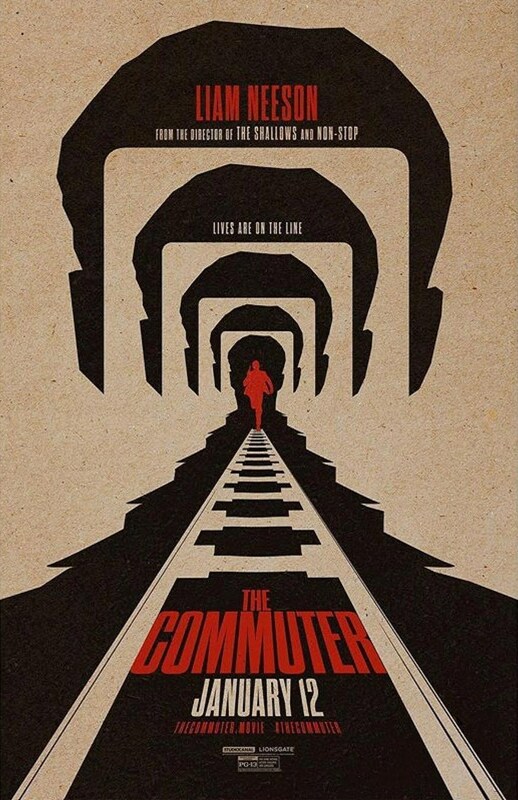 As an aside, the poster art for THE COMMUTER is spectacular! With this film I've wrapped up this week's plans to see four films in four days and am caught up on everything new I wanted to see...and I saw all four for a total ticket price of just $9.95 thanks to my MoviePass. According to Variety, MoviePass now has 1.5 million subscribers, having added half a million subscribers in just the past month. I continue to seriously wonder if the business model can be sustained, but in the meantime I'm certainly getting my money's worth, having used it for eight films in the two months since Thanksgiving. However long it lasts, like the movie, it's a fun ride. I saw the trailer the other day and this looks great. he does not go the Bruce Willis straight to video route. Marlowe in the 50's sounds like it could really work. I'm glad you enjoyed this Laura,it sounds like a fine popcorn movie. breaking concept of having the real life heroes playing themselves. I sure hope I'm right. really amazed the film did not get a sequel. I'm looking forward to 15:17 TO PARIS too, can't wait to see how casting the actual heroes works out! 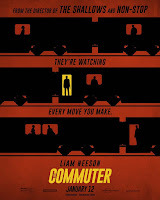 John if you're interested in more Neeson with this director, UNKNOWN and RUNN ALL NIGHT are decent action thrillers, and I was telling Laura that COMMUTER (haven't seen it yet but) reminds me of a good little UK thriller LAST PASSENGER. I'm interesting in 1517 TO PARIS as well. Saw the trailer at the theater a couple times last week. Having the actual participants as themselves is an interesting idea, and it looks like it's pretty well executed if the trailer is anything to go by. Kristina, I ordered UNKNOWN and hope to record RUN ALL NIGHT later this week! 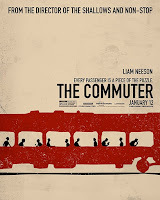 LAST PASSENGER is on my list to check out also, any train movie will get my attention.